There's a new iPhone. Well, to be completely accurate there are two new iPhones. But the new iPhone 5S is Apple's flagship phone and it's the best iPhone you can buy. It looks exactly like how the iPhone 5 looked last year but with improved internals and guts that will make everything run even faster. Twice as fast, Apple says. Oh and it also has a fingerprint scanner. There's nothing too different about the design of the new iPhone 5S compared to last year's iPhone 5. The icon-less home button has a silver (or gold) ring around it to signify the 5S-exclusive fingerprint scanner but everything else is pretty much the same. Same unibody aluminum body. Same two-toned design. Same 4-inch display. All your cases for the iPhone 5 will work with the 5S. One thing is new though. The iPhone 5S now has a new gold color option, along with the usual black and white (which is now weirdly called space gray—it's a lighter hue compared to the black 5—and silver). Powering the iPhone 5S is Apple's new A7 processor which is a 64-bit chip. It's the first 64-bit chip in a smartphone and it'll make the iPhone 5S two times faster than the iPhone 5 (and 40 times faster than the original iPhone). The 5S runs OpenGL ES 3.0 which makes the graphics performance in the 5S pretty gnarly too (that's 56x faster than original iPhone, which yay, I guess?). The A7 chip has 3x general-purpose registers, 2x floating-point registers and over a billion transistors. Along with the A7, Apple is using a "motion coprocessor" in the 5S called the M7. It continuously measures motion data with an accelerometer, gyroscope and compass support. It's supposed to "enable a new generation of health and fitness apps" by letting apps use all that motion data without tapping into the A7. 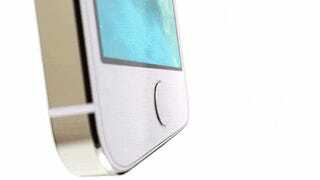 Just as we expected, the iPhone 5S' home button pulls double duty as a fingerprint scanner. Apple dubs the feature "Touch ID." The scanner adds another layer of security to your iPhone by allowing you to use the fingerprint scanner in lieu of a passcode. Place your thumb down on the new sapphire crystal home button and the iPhone 5S will unlock. The silver ring around the home button will detect when your finger is on it so you don't have to actually press down on the button. You can use Touch ID to make purchases in iTunes too and set it up so it can read multiple fingerprints. The fingerprint sensor has a 500ppi resolution and 360 degree readability. As with every new iPhone, Apple focused on making the camera even better. The iPhone 5S has dual-LED flash that might make the flash on the iPhone camera actually usable. Or at least, slightly better than the weak excuse of a bulb that did more harm than good in previous iPhones. The dual-LED flash—one is white and the other is amber—in the 5S may help make your pictures look more natural and balanced because the iPhone can combine the right percentage and intensity of the two bulbs to create 1,000 different variations of a flash. Megapixel-wise, the camera remains the same at 8-megapixels. But megapixels never tell the entire story with cameras. 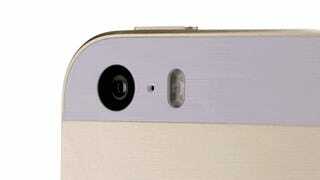 The iPhone 5S has improved its camera by using a larger f/2.2 aperture and a 15 percent larger sensor. Basically, that means the camera has 33 percent greater light sensitivity, which will make for better looking pictures. The 5S camera has an autofocus that's twice as fast, auto image stabilization, and a new burst mode to capture ten frames per second. The iPhone will analyze all those burst shots and show you what it thinks your best shot is. The iPhone 5S also has a slow-motion camera that allows it to record 720p video at 120FPS. Your videos of your cat will theoretically look more epic. The iPhone 5S has slightly better battery life with ten hours talk time, ten hours LTE browsing, and 250 hours standby. That's an improvement over last year's eight hours of talk time, eight hours of LTE browsing and 225 hours of standby. We'll have to see how this actually translates in real world use though. Apple is in the accessories game. It's selling a dock again for 30 bucks which will fit both the iPhone 5S and the discontinued iPhone 5. There's also a new leather case that comes in six different colors, which will run you 40 bucks. 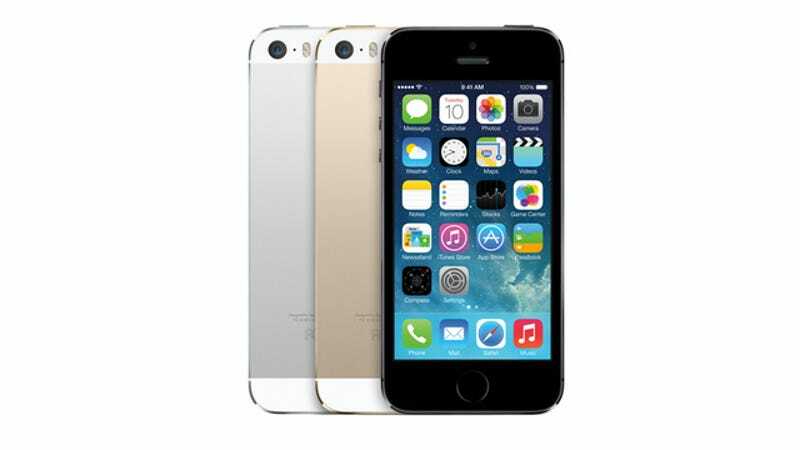 Apple is keeping the same price as the previous generation for AT&T, Verizon and Sprint. The iPhone 5S 16GB will cost $199, the 32GB version will be $299 and the 64GB version will cost $399, all with a new two-year contract. There's also an unlocked and contract-free version of the 5S for T-Mobile. Prices for the unlocked 16GB start at $650. You can start buying the iPhone 5S on Friday September 20th.